Why is Banana Good for Hair Growth? Banana is great for hair growth as it is rich in vitamins, calcium, potassium, carbohydrates and natural oils that help the overall nourishment of the hair. It also promotes shiny, silky hair with great elasticity and control. A simple banana mask can treat dandruff and hair fall. The best part is that it is natural and organic making it completely safe to use for just about anyone. The major benefits of banana for hair growth includes high potassium that strengthens your hair and reduces breakage. It is not only great for your hair but your overall health. Another reason people having been using banana for hair growth for many eons is that since it is a home remedy, we need not turn to any chemical-based facilities for treatment. Banana is not just great for your hair but is great for glowing and clear skin. It also contains many health benefits that are great for your nerves, heart, and digestion. A simple banana hair mask for frizzy hair can restore and replenish your hair thanks to its natural oils. This banana hair mask recipe contains the natural 75% water from the water which acts as a moisturizer. Apply two mashed bananas to your hair and wash it off with mild shampoo after 15-20 minutes. A banana egg hair mask benefits not just hair growth but also give your shiny and healthy hair. Apply a paste made of banana, olive oil, and egg white onto your scalp. Let the paste be on for 15 minutes before washing it off. Banana is used in body moisturizers to counter dry skin, in the same manner, you can also use a banana pack for dry hair. This banana and honey hair mask benefits you by replenishing your hair and leaving you with soft, supple hair! Mix 3 spoons of honey with a banana and apply it to wet hair. This is commonly known as banana and honey hair mask. Let it stay for 15 fifteen minutes before washing it off. Also Read: Health Benefits of Banana That You Didn’t Know About !! A banana mask for hair loss is not only convenient as banas can be found in nearly every nook and corner, but also because any banana hair mask is overflowing in keratin that strengthens your hair. Mash a banana until it is a paste and apply it on your scalp. Let it stay for 15 minutes before washing it off. One of the benefits of hair mask is that it can be made from practically anything! This banana hair pack for hair growth is made by mixing two ingredients to give your better growth and soft tresses. Mis coconut milk and banana and apply it to your scalp. Allow the paste to sit for 15 minutes before washing off with a mild shampoo. Banana hair treatment is all you will need to prevent your hair from shrinking, with the help of the Vitamins A and B that are present in it. Apply two mashed bananas to your hair 20 minutes before washing it. Weak hair is the main reason behind hair loss. A banana pack for hair fall is all you will need as it works your way into the roots of your hair, strengthening it as you go. Apply a mashed banana to your hair and rinse it off after 15 minutes. Yes, you read that right! Much like how you can use a banana mask for wrinkles you can also straighten your hair by using a hair mask with banana. Take 2 bananas, 2 lemons, yogurt (curd) and fuller’s earth (Multani Mitti). Mix these all together to form a fine paste (as fine as you can make it) without the addition of water. Put it on for 40 minutes before washing it off. The benefits of banana for hair (proteins and vitamins present in banana) provide your hair with the required nourishment that is necessary for health hair. Blend banana, coconut oil, coconut milk, and honey together and apply it one your hair. Rinse it off after 15 minutes. Wondering how to use banana for hair growth? We often mistake stopping hair fall for increasing hair growth but, this may not be the case at all. 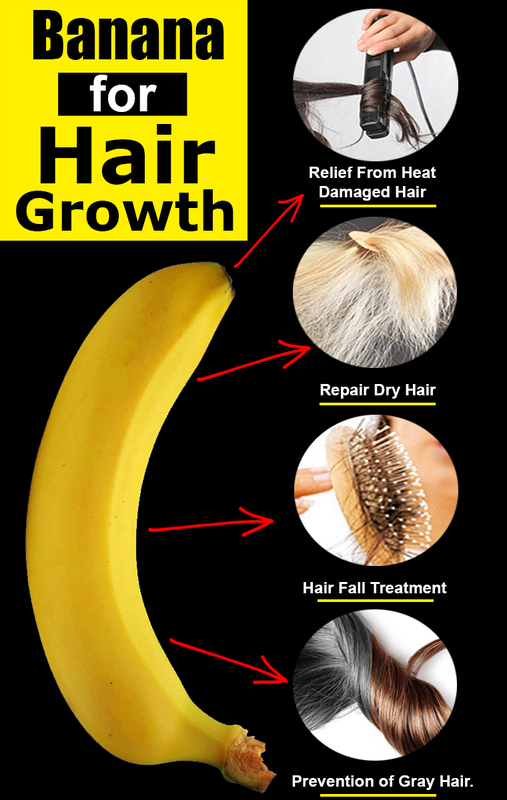 However a banana hair mask for hair growth can do just that – stop hair fall AND increase hair growth. Whip a banana yogurt mask together and apply it on your scalp. Rinse after no more than 10-15 minutes to avoid any foul odor. Even a banana peel contains so many benefits that will help with hair growth. Add banana peels in your shampoo and wash your hair with it for extra nourishment. How is banana good for your hair? This is also known as Thiamine, which is the vitamin that is responsible for the proper nourishment of hair, thereby preventing it from falling and developing split ends and dry hair. Also known as Riboflavin. This is associated with the supply of blood to the hair, helping the scalp to form red blood cells, whose lack could result in oily and dull hair. Thus a banana hair mask for oily scalp is really all you need to remove all that extra oil, while not making your hair too dry! This also called as Niacin. This too helps in the circulation of the blood to the roots, where the hair grows and needs proper nourishment. Also known as Pyridoxine. There is about 35% of this vitamin in banana which helps in the growth of cells and new cells which thereby ensures that the nervous system is in proper functioning, which in turn helps with the growth of hair, prevention of fall, growth of new strands in the place of fallen ones and prevention of gray hair. This is also known as Folic Acid. A deficiency in this vitamin causes loss of hair. Banana for hair provides us with this vitamin which helps prevent hair loss. This is the vitamin that is responsible for the maintenance of nerve and red blood cells which regulate the effect on hair color, loss of hair and strength of roots and prevents premature gray hair. This vitamin is high in antioxidants which protect the body from free radicals that are cell damaging. Additionally, this vitamin helps in the production of collagen which strengthens the roots of our hair. Our body constantly needs calcium to sustain itself, but a not very well known fact is that even our hair needs calcium to sustain and multiply itself by the consumption of adequate nutrients in it. A deficiency of this vitamin can cause loss of hair, dull and dry hair among others. This vitamin has the ability to help the circulation of blood in the scalp and production of antioxidants that make the tissues of the body continue to function normally; helping strengthen the hair roots, as a result preventing loss of hair. The preparation of banana-honey mask has already been stated above in point 3, with another mask of banana-olive oil-egg mask stated in point 2. Let us now look at an easier method to make a homemade banana hair mask. The procedure remains the same for all, irrespective of the number of ingredients. Take a ripe banana and mash it or grind it so that it settles into a fine paste and then apply it to your hair. Also keep in mind that eating bananas can benefit not just your hair growth but also your overall health! I see your blog had fresh content. I will start taking home made methods to stop hair loss. There are many items which are readily available in our house which can be used to stop hair fall/hair loss. Very good article. I am a breastfeeding mom and would like to thank you for this. I’ll have to be back to work in a few weeks and was looking for a organic way to get hair grow fast. I tried putting milk and olive oil but it is too watery and doesn’t stick to my hair. Do you have any suggestions? Also it is really hard to know what are some of the so called safe supplements, especially because of the stress I get due to hair loss. I also found that there are some nice tips on home remedies on your site Thank You.